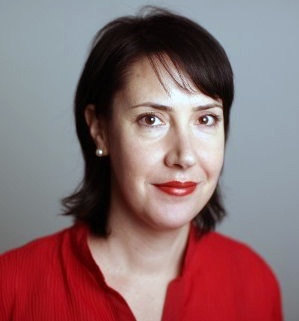 We begin today’s Weekly Roundup in the FT, where Josephine Cumbo looked at a “stampede” to cash in final salary pensions. We reported a few weeks ago that transfer values for moving out of a final salary (DB) pension are at all time highs. This is because until recently, interest rates and government bond yields were at all time lows. These are used to calculate how much money would be needed to generate an income to replace that from the pension. Transfer values of more that 30 times the projected pension income – and sometimes 40 or even 50 times – have been quoted. 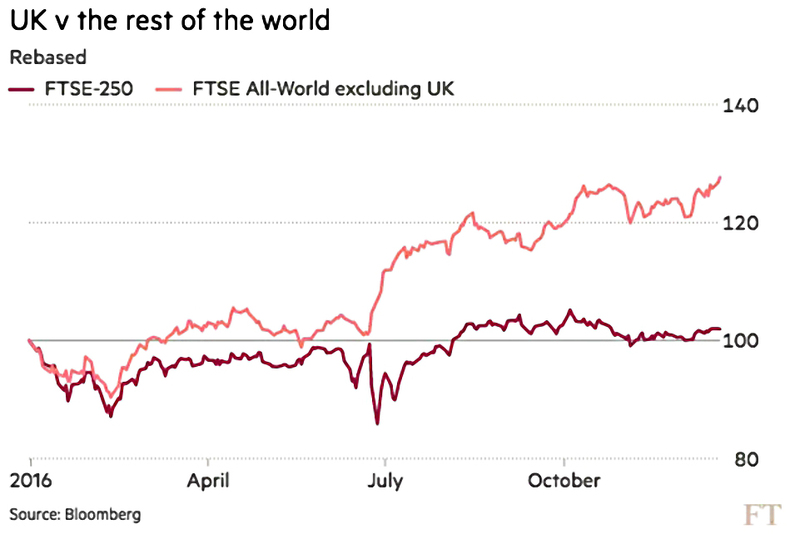 Some famous people (former pensions minister Ros Altmann, FT columnist Martin Wolf, a dozen FTSE-100 executives) have announced publicly that they have cashed in. But whilst these rates are far in excess of historical offers, they aren’t the great deal that they seem. Whenever someone makes you an offer you can’t refuse, you need to ask why. Pension trustees want to offload future uncertainties, and you need to be sure that you want to pick them up. Even at 30 times pension, you would need to generate 3.3% a year on the transferred pot to equal the pension income. For anyone with a very large pension pot, or ideally two large pots, it might be worth cashing in half of it. Following the Pension Freedoms of 2015, DC pensions do have flexibility advantages over DB schemes. They can also be passed on to family if you die before age 75. But hurry, because interest rates could rise (and bond yields and transfer rates fall) in 2017. Transfer values have most likely already peaked. For me the decision is a bit easier. 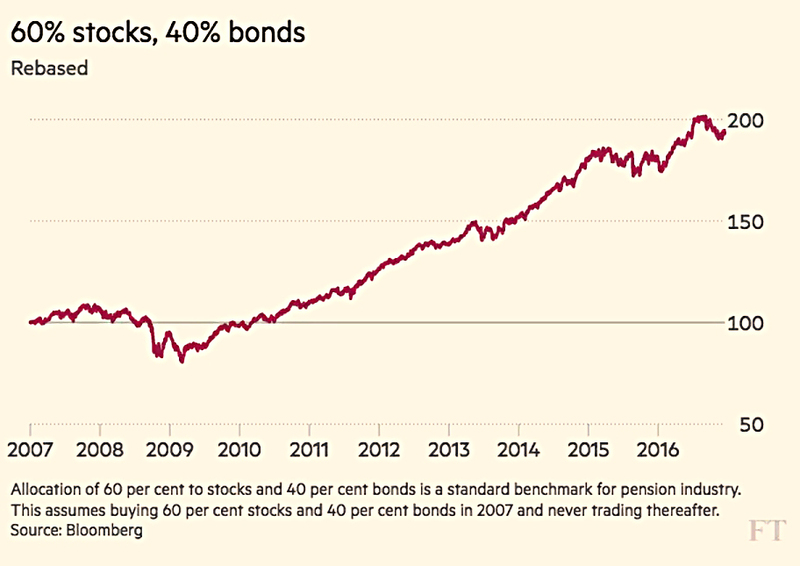 DB pensions now make up only 6.1% of my net worth, and I prefer to treat this as a form of bond investment that can’t fall in value (unlike real bonds, for which the 30-year bull market is coming to a close). 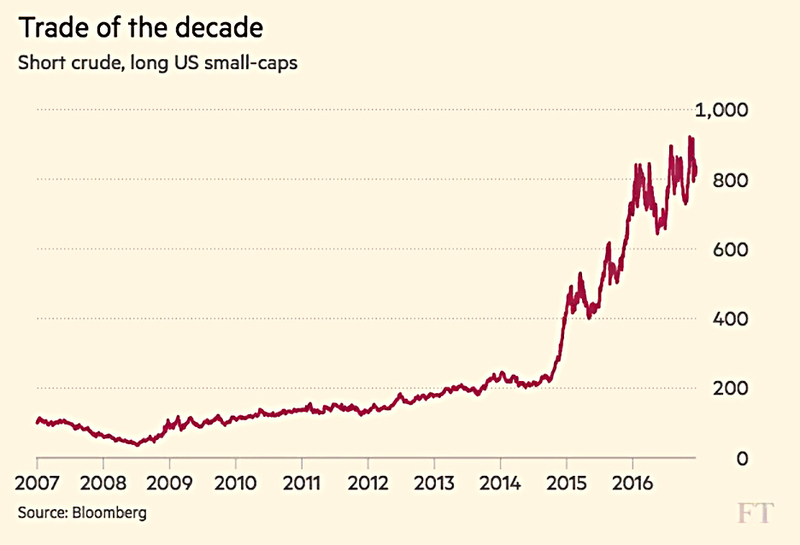 In a couple of articles, John Authers took his traditional look at what investments would have worked best if we knew what was coming. The regular article looked back at 2016, while a one-off special took a 10-year view. John restricts his imaginary hedge fund to only two sets of trades a year (the start of the year and the middle). They must also not use leverage and can’t pick individual stocks. They are also allowed to relocate to the country with the weakest currency, as this boosts returns. 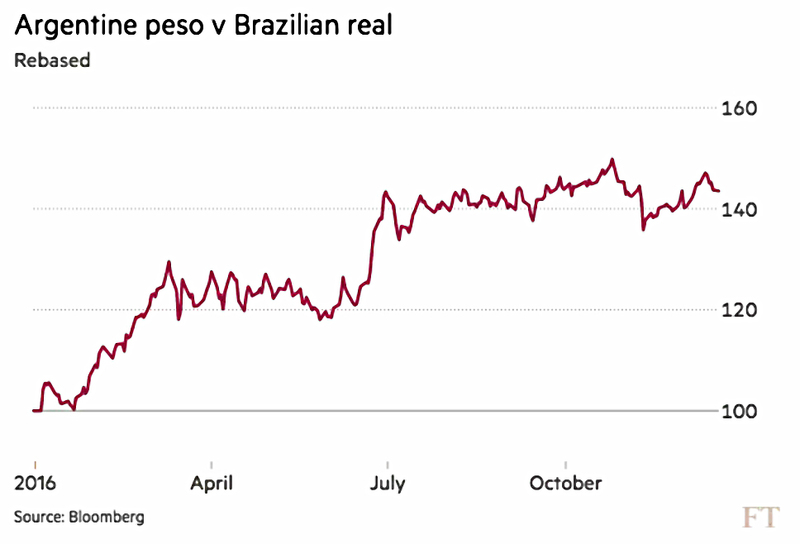 For 2016, this was Argentina2 and buying the Brazilian real and selling the peso would have made 43.5%. 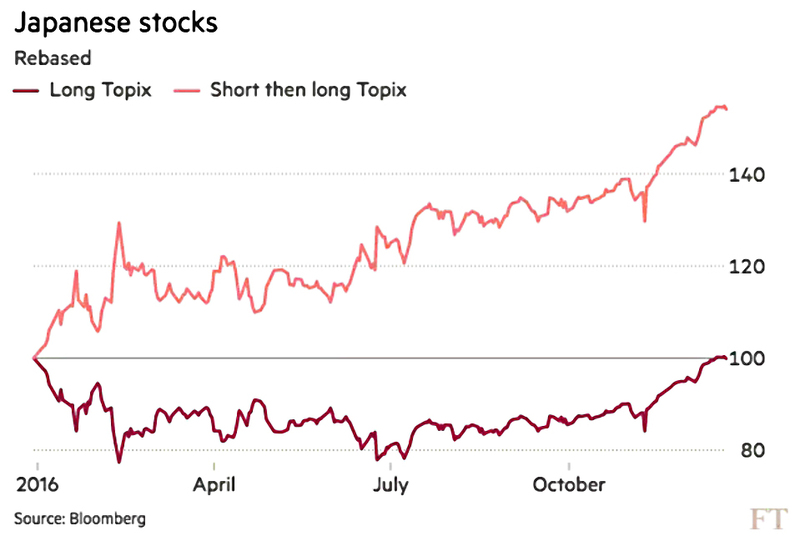 The firm also shorted China to buy Brazil’s stock market, which was up 70% in dollar terms. This trade made 92.6% (in $). 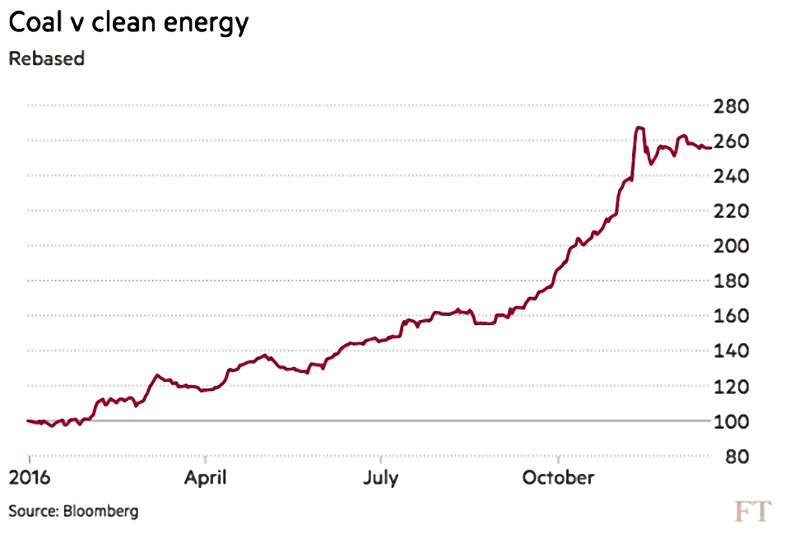 The third trade was a contrarian one, using the Paris climate change conference of December 2015 as a signal to short clean energy (via the S&P Gloal Clean Energy index) and but coal (the Stowe Global Coal index), which doubled. 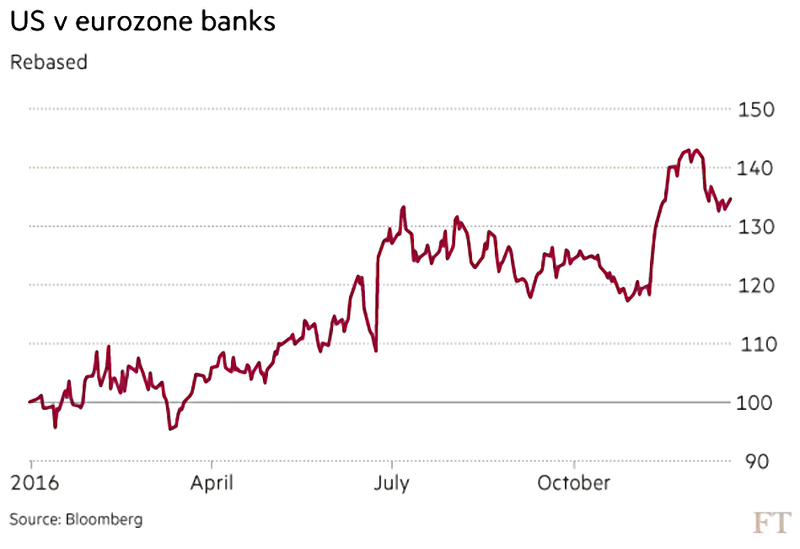 The fourth trade was to short eurozone banks (their balance sheets haven’t been fixed) and buy US banks instead. Hindsight Capital also saw Brexit coming, and sold pounds to buy BitCoin. They also anticipated that markets would ignore political shocks. They sold the Vix and bought the S&P 500, generating 69%. 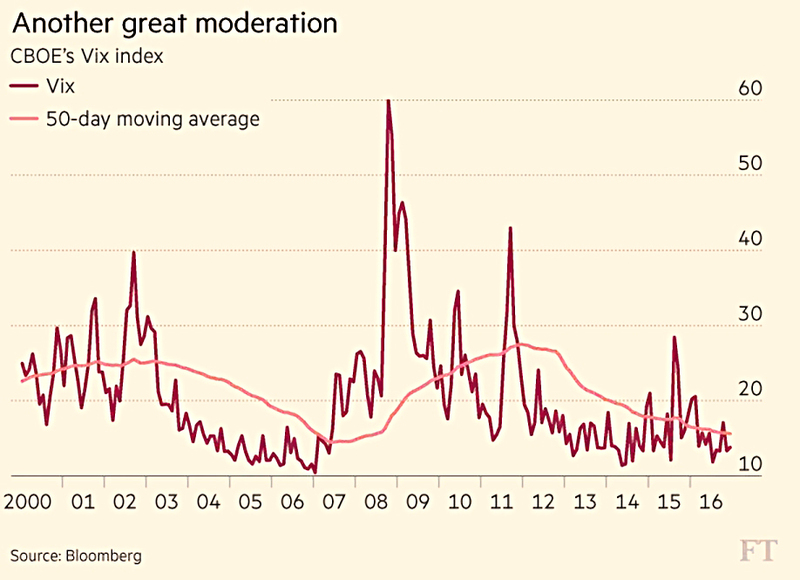 The mid-year trades focused on the switch from the fear of deflation and recession in the run-up to Brexit to thoughts of reflation and growth under Trump. Long (US) bonds, short (US) stocks in 1H2016 made 10.8%, while reversing the trade in 2H2016 made another 26.8%, for a total return of 40.6%. 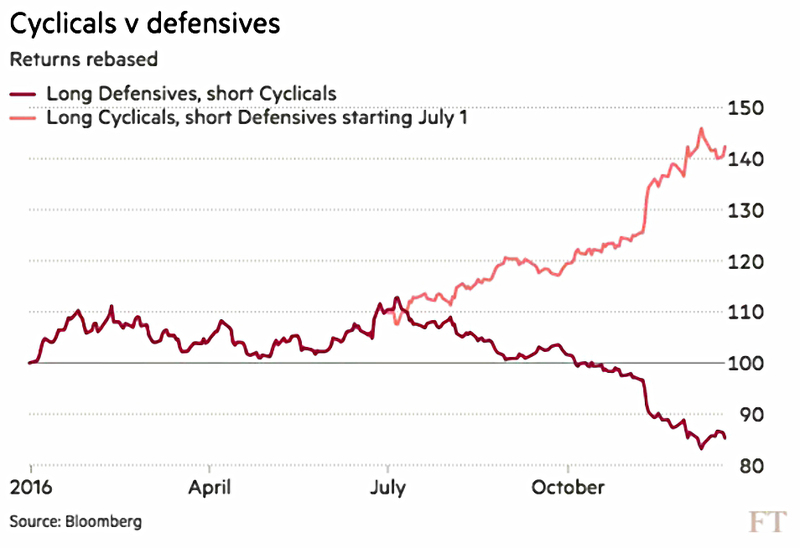 Shorting cyclicals to buy defensives, then the reverse made (somewhat suspiciously) exactly the same. Another similar trade was to buy precious metals when there are fears of growth, then switch to industrial metals when the economy is predicted to do well. This made 17.1%, then 31.2%, for a total of 53.6%. Japan also reversed direction, and short then long the Topix made 54.4%. 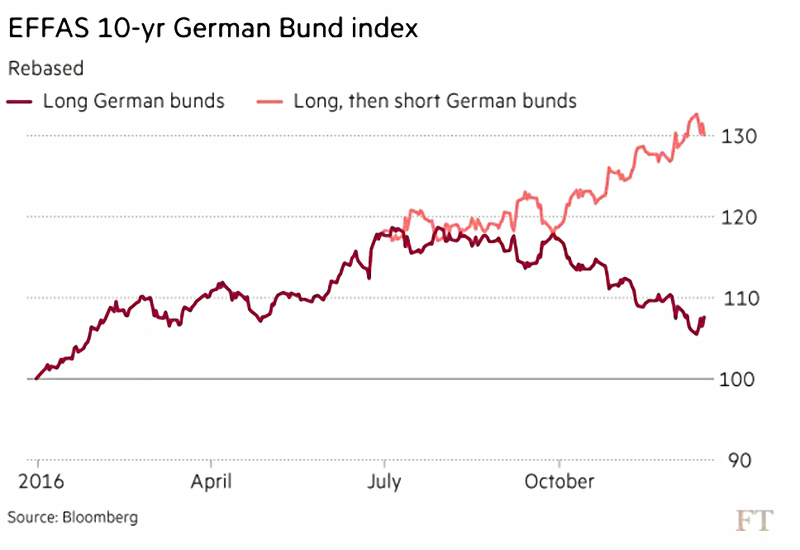 The same thing (in reverse) happened to German bunds – long then short made 30.1%. they act as a useful reference for the kind of pairs trades that can be used to exploit such factors. Now for more of the same, but this time over 10 years. The US (large and small caps) returned 97% and 98%, compared to 7.8% for the rest of the world. Europe was up 6.3% and emerging markets 19%. Crude oil lost 75% and metals dropped by half. China’s A-share market (which has only limited access for foreigners) made 86.7%. 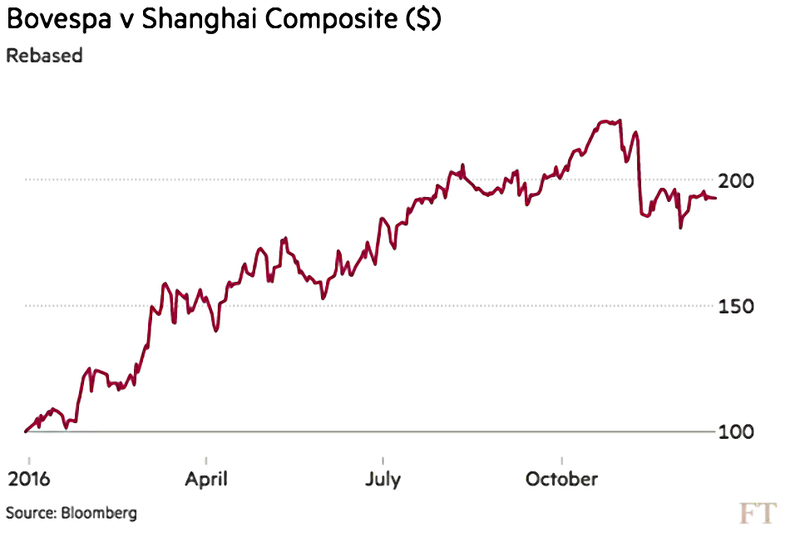 In contrast the MSCI China index (mostly Hong Kong stocks traded by foreigners) was up only 11.1%. In the Eurozone, Greece was down 97.2%, Ireland 68.6%, Italy 64.5% and Spain 46.3%. So shorting oil and buying the Russell 2000 index would have made 720%. John calls this the trade of the decade. Bonds did well, as did the traditional 60% stocks, 40% bonds portfolio. 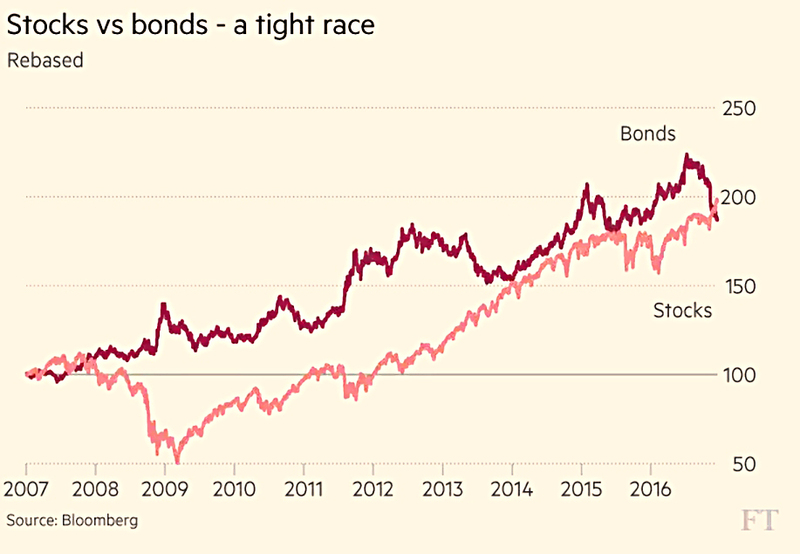 But bonds could now be ready for the decline seen in commodities over the past 10 years. 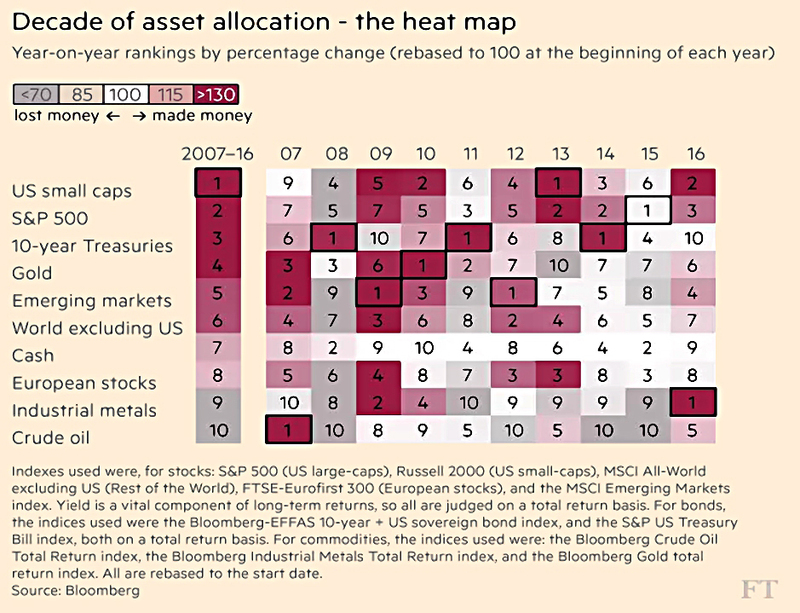 The asset allocation heat map below shows how difficult it would be to plot the optimal course through the decade. 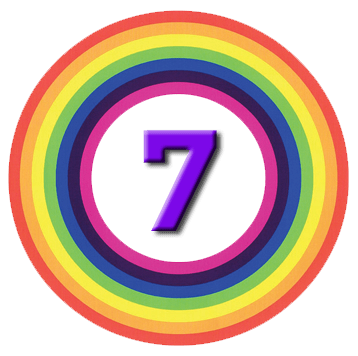 In John’s third article this week, he looked ahead to 2017. 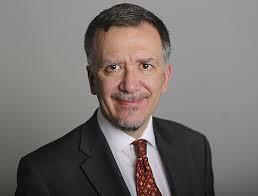 John is worried about the lack of volatility in the markets, despite political unrest. 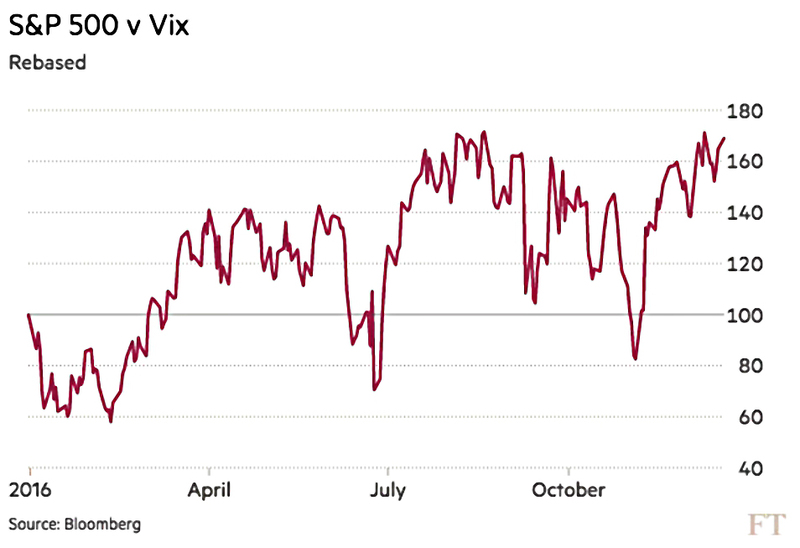 The Vix hit a 30-month low just before Xmas, and is close to its all-time low of January 2007. John talks about Minsky, an economist who said that “stability begets instability”. The idea is that lending increases when markets are calm. When it is too late, investors realise in the “Minsky Moment” that they have paid too much for credit and no further buyers can be found. Minsky was pretty left-wing – he wanted to nationalise all investment – and was not popular while alive. But his idea that risk comes from calmness more than exuberance is now widely accepted. Things that we know are high-risk will be treated carefully. This is how roundabouts prevent car accidents. In contrast, the 2008 crisis grew out of AAA-rated (“safe”) securities. John is worried about excess credit in China, dodgy European banks and a Trump trade war. In addition, interest rates look about to rise and US stocks look expensive. John’s advice is to “be careful out there”. Over in the Economist, Buttonwood was also warning of surprises in 2017. Since people are once again backing growth and stocks (on the back of Trump’s election), the first potential surprise is that the growth doesn’t happen. Similar stimulus policies haven’t fixed Japan so far. US corporate earnings should rise, but with the CAPE at 28.3 (70% above the long-term average), “a lot of good news is priced in”. And three Fed interest rate rises could push up the dollar and drag down earnings. The second surprise would be that bonds don’t fall as much as expected. Increased borrowing costs could dampen the economy, which in turn could push yields back down. The third surprise would be the EU not breaking up. If Le Pen is defeated in France and Merkel is re-elected in Germany, things could look better. 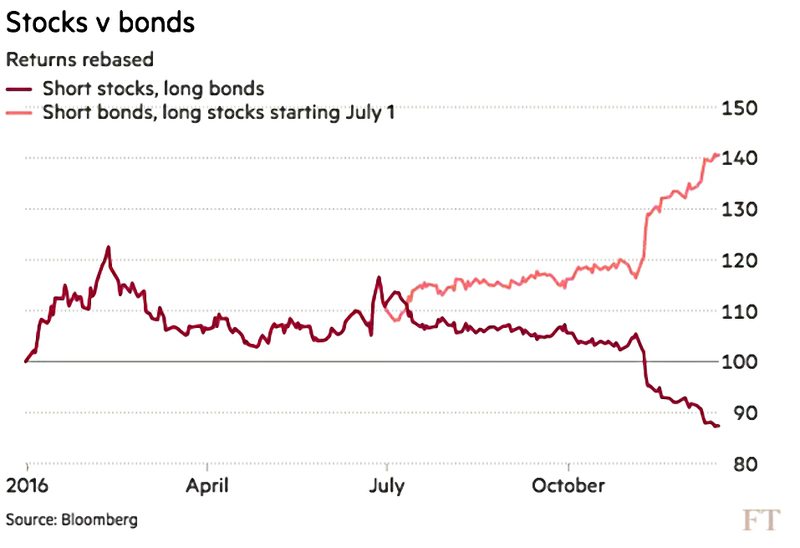 A fourth possible surprise is a flash crash in an illiquid market, such as corporate bonds. The final surprise is a gold price rally. 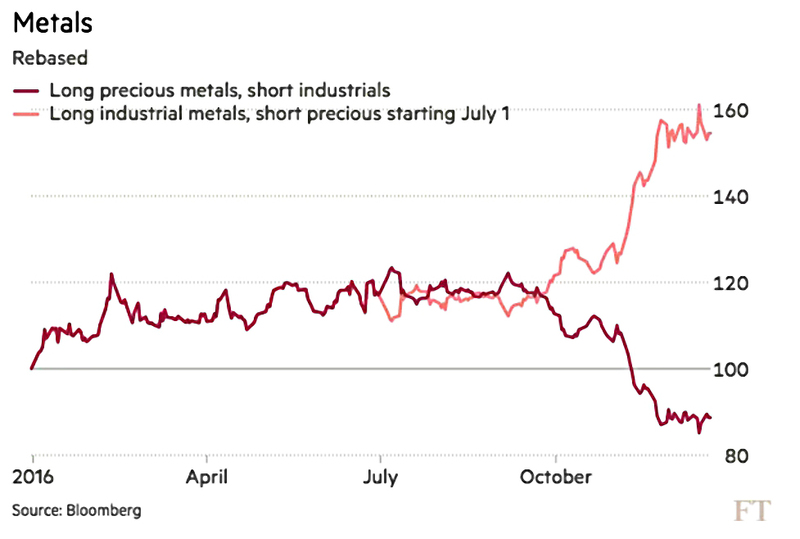 The metal has fallen as investors have preferred the dollar. But with political risk on the increase, the price could rise again in 2017. 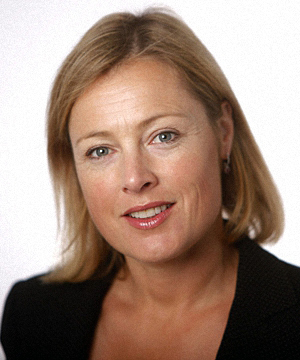 Back in the FT, Gillian Tett was also worried about political risk. France, Germany and the Netherlands will hold elections, and the UK will start Brexit negotiations. She expects uncertainty (shocks) rather than risk (events that can be predicted to have a certain probability). Which makes things harder for investors, both in pricing and hedging terms. She recommends “optionality” – stay as flexible and diversified as possible. I have to agree with this advice. 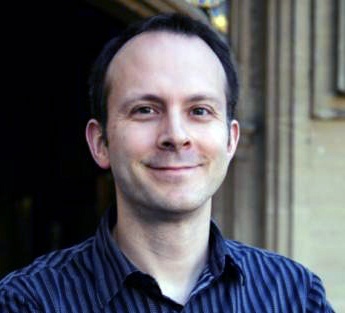 Finally, Tim Harford looked at Christmas family traditions. He began with Kurisumasu ni wa kentakki, which means that the Japanese eat KFC for Xmas. This is unusual since the Japanese don’t celebrate Xmas, and KFC took hold there as an ex-pat substitute for hard-to-find turkey. Of course, over here Santa began as a Coke promotion, and even cards, turkey, crackers and trees only date back to the 19th century. Tim has written before about the “deadweight loss” of giving people Xmas gifts that are worth less to them that you paid for them. So this time he looked at charity donations as an alternative. I gave a few Oxfam goats myself in the 1990s and I have to say that they went down like a lead balloon with my own family. New research suggests that I wasn’t alone in overestimating how welcome such gifts might be. Another piece of research suggests that observing family traditions (when to open presents, whether to watch the Queen’s speech) contributes more to positive feelings about the holiday.